(September 2012) Sikaiana translator Father Henry Tupo was on his home island working in the garden when a stick accidentally hit his left eye and damaged it badly. 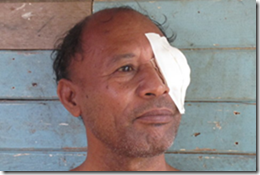 By the time a ship could finally take him and his wife to the capital Honiara for medical treatment, it was too late to save his eye. When Isles of the Sea team leaders Nico and Pam Daams visited him in the hospital, it was clear that Fr Henry may have lost an eye, but he had not lost his vision for Bible translation in his language; in fact he was busy recruiting more Sikaiana people to join in the project. Pray that he will quickly adjust to the loss of his eye, and that there will not be any complications.